For many engineers, control systems and feedback loops are most likely associated with a mechanical system such as those used to regulate room temperature or motor controllers. However feedback control also occurs widely in natural systems, and is in fact critical to the survival of many living organisms. Childbirth, breathing, and aversion to pain are just a few examples of feedback loop governed processes essential the survival of humans and animals. The need for these systems is by no means exclusive to larger, more complex organisms. On the other end of the spectrum, bacteria rely just as heavily on feedback control systems to follow chemical gradients to find light or food, and to communicate with each other via quorum sensing. Schematic diagram of a generic microbial feedback loop, taken from paper. These kinds of bacterial control systems have attracted significant attention in the field of synthetic biology, which aims to reengineer existing natural systems to our benefit. In recent years there has been interest in the implementation of negative feedback control schemes that may be used for control over gene expression within cells. While some of these experimental approaches look in some ways similar to a traditional mechanical control systems, with apparatus for sensing and actuation and computer algorithms acting as the control, a more desirable set up sees all these functions embedded within the cells themselves. This type of synthetic feedback control has been implemented within single cells in a number of papers, and successfully achieved set point regulation as well as tracking of target proteins. There are however a number of issues associated with the integration of complex circuits in just one cell; the metabolic burden upon the cell is large and in some cases unfeasible, and the system suffers from poor modularity, as once engineered there is no real way by which the control strategy may be adapted without an overhaul of the entire scheme. 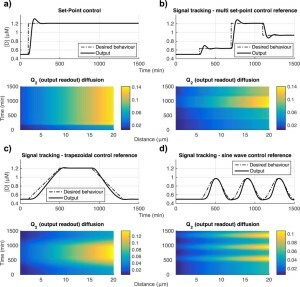 A new study by Gianfranco Fiore and Antoni Matyjaszkiewicz (Engineering Mathematics and Bristol Centre for Synthetic Biology-BrisSynBio-) aims to address these problems by proposing a multicellular feedback control strategy in which the synthetic circuit is distributed between two separate populations of bacteria. This uses ideas from classical control schemes, which are intrinsically modular, and poses the question of whether adding such modularity to a cellular system may increase the overall robustness and decrease metabolic load by distributing the required tasks of sensing, computation and actuation across two populations. This question is explored in the paper through in-silico analysis using two separate methods; one aggregate population scenario to test whether the proposed set up is practical, and the other an agent based model, which adds complexities such as growth and individual cell dynamics. In both model scenarios the system is described in the same terms, depicted schematically below. The population of controller cells are able to sense some external reference signal, compare this to the process output received from the controller population and regulate this process accordingly. Two way communication takes place between the populations through the exchange of two types of quorum sensing molecules, referred to here as Q1 and Q2. The external reference signal provided is an inhibitor of the production of species A, which is responsible for the production of species B through forming a complex with the Q1 molecules. Species B is then a catalyst for synthesis of Q1 which provides an input signal to C, the actuator species of the target population. To form a complete loop, the species D (the process being controlled) acts as a catalyst for the production of Q2. The controllers are therefore able to “compare” the external reference signal with the level of Q2 sent back by the target population, and regulate this through the production of target input signal Q1. Note that it is critical that the two quorum sensing paths Q1 and Q2 have orthogonality to avoid interference between the sensing and regulating pathways. The mathematical description of this process is also constant between the two models with the concentrations of the A:Q2 complex and species B,C and D inside and outside the cell modelled as ODEs, and the spatial diffusion of the communication molecules between the target and controller populations modelled by PDEs. The model is then laid out in three sets of equations; one set describing the concentration of species in the controller cells, one describing concentration of species in the target cells and the other modelling communication between the two. For a full mathematical description, see here. In order to test the system computationally, two goals were set. One being set point regulation in which the system output (species D) must be kept constant at a specified value and the other signal tracking, by which the system output must track a particular concentration profile, which varies over time. Three time varying profiles were used, and so together with the set-point regulation the four specified profiles were: set-point, multi set-point, trapezoidal and sinusoidal. Both models were tested using the above criteria in three different scenarios. Initially, control results were obtained by assessing the ability of the system to perform the profile tracking under normal conditions. The robustness of the system was then tested by performing the same analysis while monodimensionally varying the cell separation. Finally, the modularity of the system was tested by attempting set point regulation while perturbing the parameters first of both populations together, then the target and controller parameters separately. In all cases, the system was shown to be exceptionally robust to both spatial variations and parameter perturbations. The results obtained from the two models (shown below) were on the whole very similar, the aggregate population model found that in the control study, set point regulation was achieved with a settling time of 150 minutes and an overshoot of below 10%, while in the agent based model the overshoot was up to 18% but had a settling time of less than 50mins. The strong agreement of in-silico results between the two different computational approaches suggest that the proposed multicellular feedback control system is highly efficient, and remains so ever under worst case scenario cellular separation and large perturbations. The inherent modularity displayed by the system suggests that a given set of controller cells could be used for regulation over a number of different target cells, in this way different target-controller systems could be built up without the need to reengineer the entire scheme. It also suggests that there may be scope to control two target populations using the same controller cells, however it is crucial that the quorum sensing systems remain orthogonal between the N different populations. The ability to efficiently engineer these kinds of embedded cellular controllers to produce a desired output has massive implications for a number of applications, including chemical synthesis in bioreactors, regulation of biosensors and even targeted drug delivery.